The Visual Communications team at PDR has been invited to showcase our work at San Jacinto College’s Gallery from October 30th through November 17th. 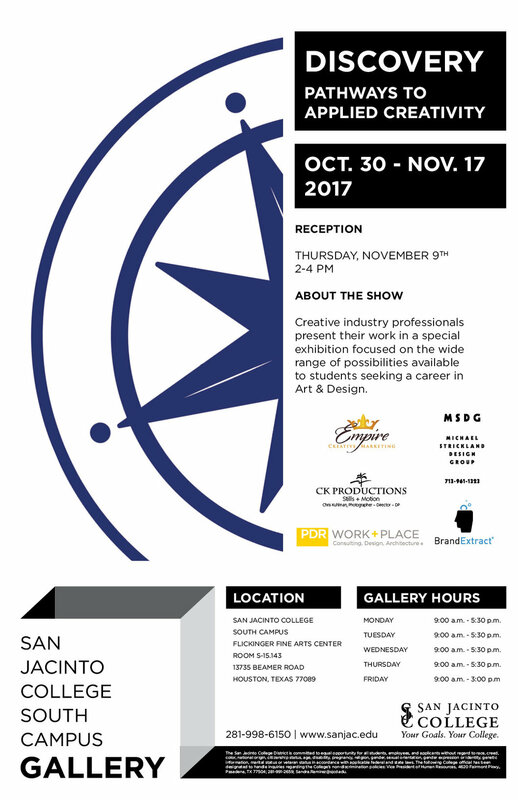 The exhibit was developed to allow creative industry professionals a way to present their work in a unique format with the purpose of showcasing career possibilities to students studying art and design. As graphic designers and visual artists, our work is embedded into architectural projects, and is often multi-dimensional with an impact that is experienced at the human scale. For the exhibit, the Visual Communications team at PDR, created an exhibit that plays with the shift from 2D to 3D by engaging the iconic House of Cards system originally designed by Charles and Ray Eames. For our exhibit, each card represents one PDR project, and together the cards create a framework of the designs our Visual Communications team has brought to fruition. From the ground up, our exhibit displays the culture, values, and workplace designs of PDR. Welcoming the visitors, a die cut message lies on the floor saying, “We shape context into meaningful experiences”. You are invited to visit the exhibit during regular gallery hours, Monday-Friday from 9 am-5:30pm.